Witgenstein has been extremely well written about and painted about. As a result, it is hard to come across something fresh. Especially, because a lot of the visual artists seem to have a very bleak grasp of Wittgensteins ideas (or any other language matters, in fact). I will get back to this subject later. Anyway, here's what I have found and I thought it was really good and really well made. 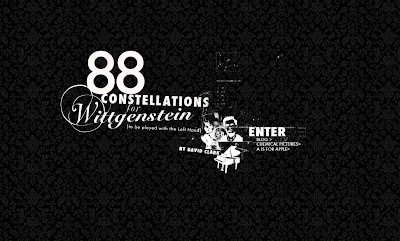 “88 Constellations for Wittgenstein (to be played with the Left Hand)” is an interactive artwork by David Clark. The piece is a sprawling, non-linear contemplation of the life and work of the Austrian philosopher Ludwig Wittgenstein consisting of 88 interactive flash animations each corresponding with one of the 88 constellations in the night sky. The viewer is invited to navigate through a maze of interconnecting narratives – moving from association to association – in a way that brings Wittgenstein’s work into conversation with our contemporary digital culture. As a nod to Wittgenstein’s concert pianist brother Paul who lost his right arm in World War One but continued to perform work for the left hand, the piece invites the viewer to ‘play’ with the collages using the left hand on the computer keyboard. At the centre of piece is the number 88. It is both the number of keys on the conventional piano and the number of constellations in the night sky (as determined by contemporary science). Music and the night sky both seem to me to stir up the limits of our understanding of existence. The constellations also provided me with a structure. The work is like a ‘connect the dots’ portrait of Ludwig Wittgenstein. I have drawn the facts of his life together and numbered them but it is up to you to connect the dots.